These cute fish earrings swim just below your ears. 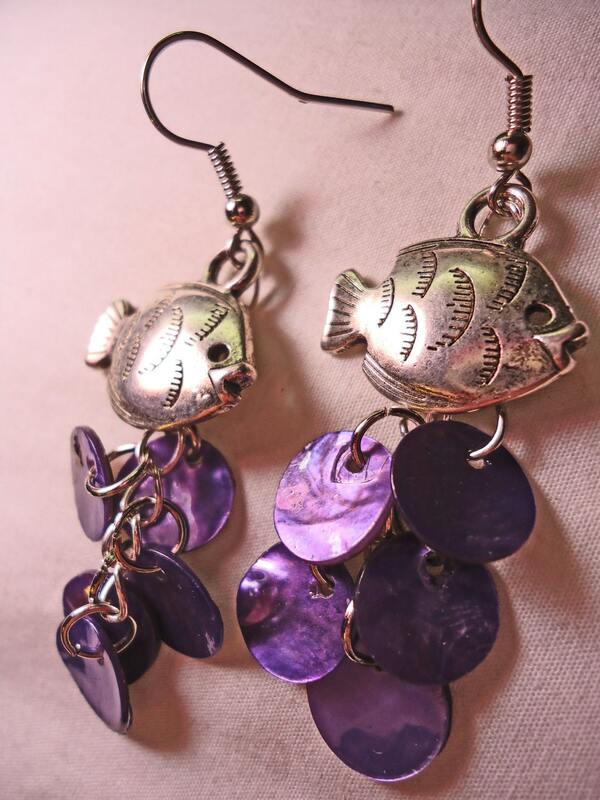 With silver toned fish charms and purple shell discs they are the perfect accessory for any summer outfit. The shells dangle from a chain that hangs behind the fish. These earrings are surprisingly very light weight. Folksy :: Buy "Purple and Green Shell Bracelet and Earrings"
Folksy :: Buy "Blue Shell Earrings"
Folksy :: Buy "Black Dotty Earrings"
Folksy : Handmade "Polymer Clay Flower Earrings, Purple and White on Silver Hoops"
Folksy :: Buy "Sterling Silver and Crystal Pink Earrings"
Folksy :: Buy "Midnight purple earrings"